When asked their opinion about Southeast Asia, a lot of people imagine Southeast Asia as the collection of developing countries. But Thailand in particular is a little bit different from the rest of Southeast Asia. Thailand has never been colonized in its history and had a high economic growth over 20 years ago as the manufacturing base of Western countries and Japan. Thailand has widespread development area and high quality infrastructures, thus sometime even referred as “developed nation of Southeast Asia”. In 2012, due to the great raise in minimum wage, the spending power has increased and had a population increase of middle class. In the past, companies saw Thailand as the bright destination for their offshore offices due to its high education standard and cheap labor expense. In recent years however, Thailand as market has been catching some attention due to its spending power. Comparing to the other Southeast Asian countries, population of 68 million people might not appear so impressive. In addition, birth rate is far lower than other countries and the population is estimated to stay mostly stagnant with the slight increase in the future of the longer life expectancy. Looking at the population demographic by age group, the graph is not pyramid shape, which is the typical shape for developing countries, but it is shaped closer to a bell which is the common shape for developed countries. 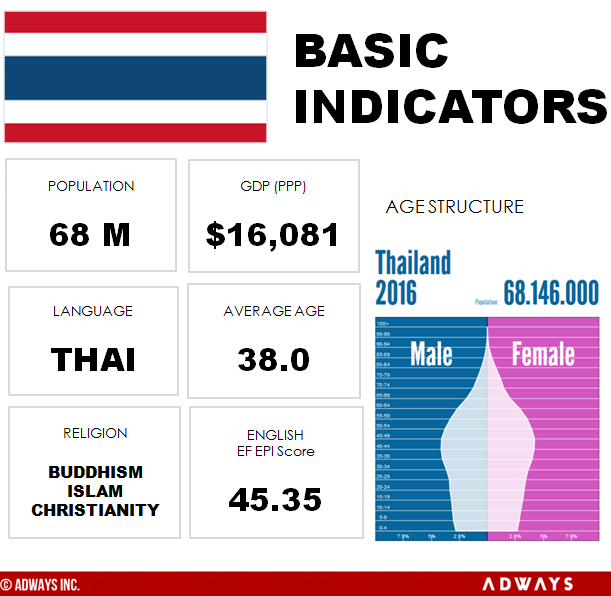 Considering the stable infrastructures, decent size population, growing middle class and their eagerness to spend, Thailand should be regarded as a market that is near its maturity at this moment rather than a market with unknown future potential due to the population growth. Even though Southeast Asian countries in general might seem less desirable when compared to European countries or East Asian countries, Southeast Asia and Thailand especially is a popular starting ground for many developers. As Thailand has relatively smaller population, it is one attractive market to test out their products, saving the promotional budget.